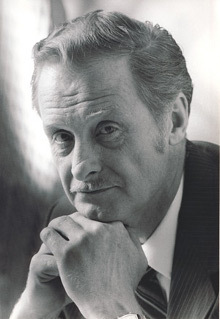 David Eddings (July 7, 1931 – June 2, 2009) was Leigh Eddings' husband and an American fantasy writer. With his wife Leigh, he authored several best-selling epic fantasy novel series, including The Belgariad (1982–84), The Malloreon (1987–91), The Elenium (1989–91), The Tamuli (1992–94), and The Dreamers (2003–06). Part Cherokee and born in Spokane, Washington, to George Wayne Eddings and Theone (Berge) Eddings, in 1931, Eddings grew up near Puget Sound in the City of Snohomish. He described a good day in Seattle as "when it isn’t raining up". Rain became a consequent feature in many of his novels. After graduating from Snohomish High School in 1949, he worked for a year before majoring in speech, drama and English at junior college. Eddings displayed an early talent for drama and literature, winning a national oratorical contest, and performing the male lead in most of his drama productions. He graduated with a BA from Reed College in 1954. He wrote a novel for a thesis at Reed College before being drafted into the U.S. Army. (He had also previously served in the National Guard.) After being discharged in 1956, Eddings attended the graduate school of the University of Washington in Seattle for four years, graduating with an MA in 1961. Eddings then worked as a purchaser for Boeing, where he met his future wife. They adopted one boy in 1966, Scott David. Records suggest they adopted another girl between 1966 and 1970. After seven years as a tenured college professor, Eddings moved to Denver in 1971 to work in a grocery store. He later said this was because of a failure to receive a pay raise, but newspapers of the time revealed it was right after the couple lost custody of their children due to child abuse. He soon began work on his first published novel High Hunt, the story of four young men hunting deer. Like many of his later novels, it explores themes of manhood and coming of age. Convinced that being an author was his future career, Eddings moved to Spokane where he once again relied on a job at a grocery shop for his funds. He worked on several unpublished novels, including Hunseeker’s Ascent, a story about mountain climbing, which was later burned as Eddings claimed it was, "a piece of tripe so bad it even bored me." Most of his attempts followed the same vein as High Hunt, adventure stories and contemporary tragedies. The Losers, tells the story of God and the Devil, cast in the roles of a one-eyed Indian and Jake Flood. It was not published until June 1992, well after Eddings's success as an author was established, although it was written in the seventies. Eddings's call to the world of fantasy came from a doodled map he drew one morning before work. This doodle later became the geographical basis for the country of Aloria, but Eddings did not realize it until several years later. Eddings' story of this was that upon seeing a copy of Tolkien's The Lord of the Rings, in a bookshop, he muttered, "Is this old turkey still floating around? ", and was shocked to learn that it was in its seventy-eighth printing. Eddings realized that the world of fantasy might hold some promise for his talents, and immediately began to annotate his previously forgotten doodle. Over the course of a year he added names to various kingdoms, races and characters, and invented various theologies and a mythology, all of which counted about 230 pages. Because Lord of the Rings had been published as three books, he genuinely believed fantasy in general was supposed to be trilogies. Which is why he intended The Belgariad to be a trilogy as well, and had it all laid out, when Lester Del Rey told him the booksellers would refuse to accept 600-page books. Instead he suggested the trilogy should be published as five books. Eddings at first refused, but having already signed the contract, and with Del Rey's promise that he would receive advances for five books instead of three, he eventually gave in to the suggestion. He had also included Tolkien's work in the syllabus for at least three sections of his English Literature survey courses in the summer of 1967 and the Springs of 1968 and 1969. On January 26, 2007 it was reported that Eddings accidentally burned about a quarter of his office, next door to his house, along with his Excalibur sports car. He was flushing the fuel tank of the car with water when he lit a piece of paper and threw it into the puddle to test if it was still flammable. When asked to explain it to the firefighter he said "One word comes to mind. Dumb." Eddings resided in Carson City, Nevada, where he died of natural causes on June 2, 2009. Dennis, Eddings' brother, said that he had been ill with dementia for a long time, but his health had been on a very fast downhill slide since September, and required 24-hour care. He also confirmed that in his last months, his brother had been working on a manuscript that was unlike any of his other works, stating "It was very, very different. I wouldn’t call it exactly a satire of fantasy but it sure plays with the genre". The unfinished work, along with his other well renowned manuscripts, went to his alma mater, Reed College in Portland, Ore., along with a bequest of $18 million to fund "students and faculty studying languages and literature." Eddings also bequeathed $10 million to National Jewish Medical and Research Center in Denver for pediatric-asthma treatment and research. Eddings's wife Leigh had asthma throughout her life. ^ Robb, P. Bradley (2009-06-03). "David Eddings, Dead at 77". Fiction Matters. Retrieved 2009-06-03. ^ "Recalling the late David Eddings, Lord of Creation". starlog.com. Archived from the original on 15 August 2009. Retrieved 19 August 2015. ^ "Starlog Interview with David Eddings – SFBookcase Archive". farris.co.uk. Archived from the original on 4 March 2016. Retrieved 19 August 2015. ^ "Mr and Mrs Eddings Adopt First Child, Scott David". Retrieved 17 April 2019. ^ a b c Gifford, James (2016-09-30). "A Frightful Hobgoblin Stalks Through Modernism?". Retrieved 7 October 2016. ^ "Witnesses Tell of Child Abuse". Retrieved 17 April 2019. ^ F.T. Norton (2007). "Novelist accidentally burns down office". Nevada Appeal. Archived from the original on February 2, 2007. Retrieved 2007-01-27. ^ "Décès de Leigh Eddings". Elbakin.net. 2007. Retrieved 2007-03-06. ^ Neill, Graeme (2009-06-03). "Fantasy writer David Eddings dies". Bookseller.com. Retrieved 2009-06-03. ^ "Fantasy writer David Eddings dies in Carson City home". The Nevada Appeal. Retrieved 19 August 2015. ^ "Fantasy writer David Eddings leaves Reed College $18 million". The Oregonian. 2009-07-15. ^ Trageser, Claire (2009-07-17). "Late author leaves $10 million to National Jewish". Denver Post. Archived from the original on 2009-07-18.